Melvil Dewey and the Library Bureau succeeded in making the card catalog the preeminent library bibliographic tool of the twentieth century, but for a brief time there was another contender for this distinction. This card catalog alternative was the Rudolph Continuous Indexer, and its history is linked to that of the Newberry Library in Chicago, Illinois. 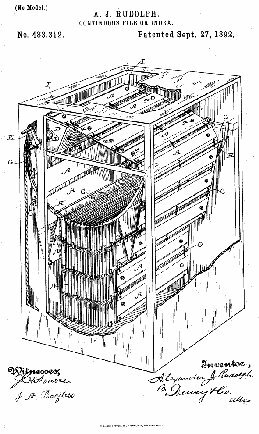 The Rudolph Continuous Indexer was invented by Alexander J. Rudolph, who served as Assistant librarian of the Newberry from 1894-1911. It was introduced by Rudolph in 1893 at the meeting of the American Library Association at the World's Columbian Exposition in Chicago. 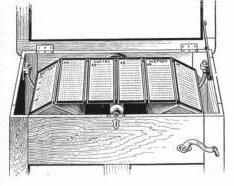 The Rudolph Indexer Company was created to market the device, but competition from Dewey's Library Bureau was too much for the company to survive. The principal drawback to Rudolph's indexer was that only a single user could use the device at any one time. Rudolph committed suicide in 1917. 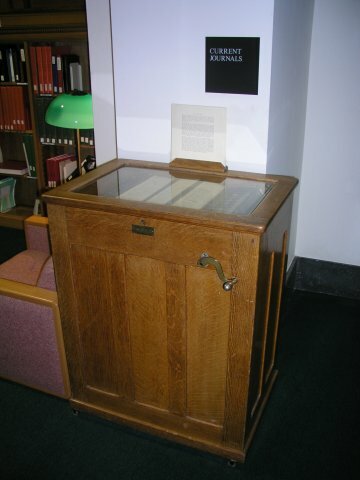 Perhaps the only remaining example of a Rudolph Continuous Indexer is located in the Reading Room of the Newberry Library. 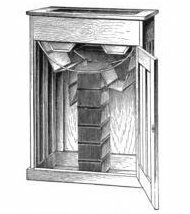 Appletons' Annual Cyclopaedia and Register of Important Events of the Year 1895 described the Rudolph Continuous Indexer as follows: "This [the indexer] consists essentially of a box with a glass top, standing about breast high, and furnished with a crank. Inside are 2 hexagonal prisms turning on their axes, to one of which a crank is attached. Around these, and falling almost to the bottom of the box, is an endless chain made up of light metallic frames with flanged edges, into which can be inserted cards containing the designations of the books in the library. Looking in through the glass top, the user sees 4 long pages of cards arranged in alphabetical order, and he can turn the crank in either direction to bring into view any other pages that he may want. The fames of the pages are so linked together that they can be readily unlinked at any point, and additional ones inserted. Short wire projections at the corners of every sixth page slide upon semi-circular guides, and cause the slack of the endless chain, or that portion not in immediate use, to arrange itself in a compact and methodical manner within the box, as shown in the illustration." Illustrations from Appletons' description are shown below. An illustration from Rudolph's patent (No. 483,312) for the Continuous Indexer. Retrieved from the Google patent search. Thanks to Richard Douglas for the photographs below of the Rudolph Continuous Indexer in the Newberry Library.